Bing Maps, Microsoft's online mapping application, has just launched a big update in Bing Maps Beta with lots of cool new features. As you will see, the new maps site requires the installation of "silverlight" which you will be prompted to install, but it can be used in most ie, firefox, or safari browsers. 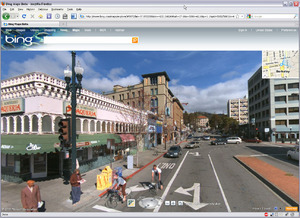 Though there are many new features, be sure to check out the "Streetside" viewer, Microsoft's answer to Google's Street view. Streetside takes a similar aproach in displaying photos along streets, but also takes advantage of the building surfaces for 3D viewing.